Our collections include around 3000 films and videos. The majority of titles in our collections were created by official local government bodies such as the London County Council and the Inner London Education Authority. 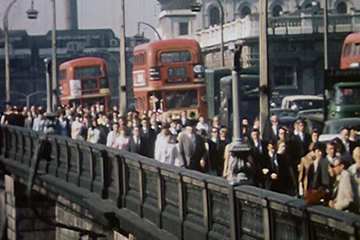 The diverse range of subjects includes housing, parks, transport, markets, cycling and health services and in most cases London is at the heart of the film. London Metropolitan Archives (LMA) is home to an extraordinary range of documents, images, maps, films and books about London, dating from 1067. We run a wide variety of talks, guided tours, film screenings, exhibitions and other events. Access: On demand access though our Mediatheque space opens up the film archive and digital image collections for personal research via 10 individual terminals. Visitors also have the opportunity to enjoy a film on the big screen, using wireless headphones for added comfort and practicality.